The original recipe called for an egg which I replaced with a mashed banana and 2 tbsps yogurt. Mouth-watering!! Was wondering how to use overripe bananas… perfect! Could u pls add microwave recipes too.. or if microwave was being used in a particular recipe, the procedure. Crunchy topping is very tempting. Can’t wait to try. 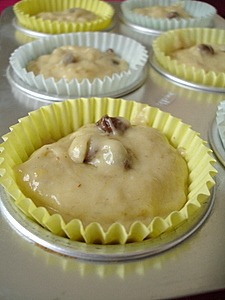 Nice way to use up overripe bananas, which i always have in plenty. Sailu – It looks gorgeous. I always end up making banana bread – at least I can now have an option with those over ripe bananas. The substitution of the egg was very cool. hey sailu … its mouthwatering. definitely wud try these ..but what if i have to use eggs how many do i use instead of bananas .. let me know. I am a constant viewer of your website .. now i am so addicted that the first thing i do is check ur website in the morning .. thanks for sharing such good recipes and wonderful pictures. Thank you, Sri. :) One egg or in its place one mashed banana+2tbsps yogurt. wow wow wow!! !simply delicious….tempting photos too…loved it. Sailu, it can’t be a better way to use the over ripen bananas, kids will just love them esp the crumbs are making me saliavate. Very good pictures. hey sailu â€¦ its mouthwatering and yummy too. definitely I will try these ..
thanks for sharing such yummy recipes. May I have one please? Looks so yummy and an ingenious way to use up overripe bananas. Its surprising how the sugar is crumbly even after baking. Cute breakfast indeed. That luks so yummy and im writing this at 1 in the afternoon without having food so u can imagine.. This might sound silly but where do you buy paper cups for the muffins? Since yesterday i have this craving to bake muffins, I have the steel pan and steel cups but i don’t have paper cups. I don’t know where to buy them here(Noida). Can I still go ahead and bake them in the steel pan directly? The muffin liners were from US. Cupcake or muffin liners will be available in most bakery supply stores. You can grease the muffin pan and spoon the batter. Dear sailu …muffins look wonderful and cannot wait to make them..
Dear Sailaja, Always a pleasure to be here. Kindly click on the link below, we have something special for you there, for those of you who really inspired us to enter the blogging world. Thank you!We can always use a new way to use bananas with so many getting ripe around here. As I’ve said many times before – awesome post! She loved it! Except I messed up with the crumbs….mine were goooey. Guess I added very little sugar and flour compared to the butter. I also added some raisins and walnuts. Next time I shall make em more powder like consistency. Hey Sailu, I’m with Stella on microwave method to your recipes? Please? Because I don’t have an oven, you know. A fortnight ago I figured out how to do the dum for biriyanis in a microwave, and I’m pretty impressed with myself! lovely looking muffins there!!!!! !please can u let me know how to make these in microwave ? Yum-O I am going to try this.My daughter loves these banana cup cakes as she puts it and loves anything that is crunchy. Thanks for making this and sharing it with us. I loved the photo makes me want to bake. Just never posted a comment, made it abt 10 days ago and it was a super hit, at a potluck party. Everyone liked the flavor of banana. One lady said that instead of choco chips, one should use walnuts or pecans to get the right taste. I too felt when she said, as i am not a chocolate freak. But my boys like the combo. Thanks again Sailu. Please, post something. The first thing I do after coming to office everyday is check whether you have posted anything. All your posts are so good and your food and pictures are heavenly. Thanks for making our cooking(learning) experiences beautiful. this one’s look really wonderful…..
i dont know how u take such wonderful pics…. thanks for such wonderful recipes…. My daughter loves banana bread/muffins too. I’ll have to try the crunchy topping next time. lovely! Thank goodness for sorry looking bananas! Hi…sailu…i baked these today and they taste great…thanks for a great recipe..
look awesome….the crumb topping makes it look spectacular!! I’m a regular visitor, but first time i’m posting a reply. I’m ur namesake. Love ur recipes, i becoming more regular nowadays. Do let me know,how this muffin can be made in a microwave, i dont have an oven. I’m waiting to try it. My kids love cup cakes. this sounds healthy. Looks lovely. Can I bake this as a cake instead of a muffin ? Also , can the banana + yogurt be used as a egg substitute in all recipes ? Or is it different for cookies, cakes etc ? I came across your site and tried the banana muffin and it came out perfecto!! And I have tried my hand at baking with a recipe so far. I always used to just buy a cake mix and mix eggs+oil and bake it. Wonderful recipe … i love cake recipe’s …. 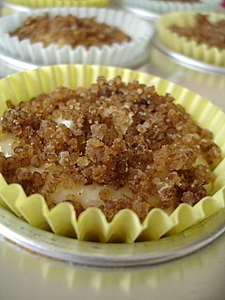 i have a small doubt can i use brown sugar(powdered one) for the crumbs … Thank You for ur great recipe’s ….. Your welcome, Kalyani. 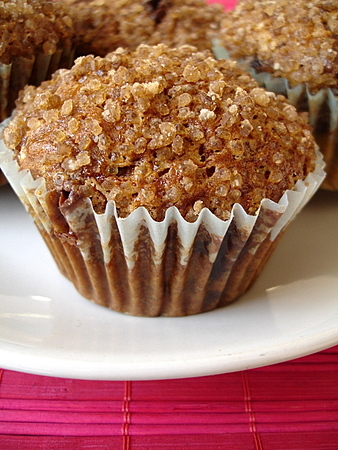 You can use coarsely pwd brown sugar. Today i prepared it for breakfast .. it came out very good …. my kid and husband liked it a lot …… Thanks to u and ur great site …. 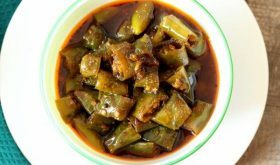 Keep Going with great recipeâ€™s …. I made the banana muffins and they turned out to be awesome and was a big hit with the kids and my hubby. I had only 2 bananas and used only 2, but then the taste was awesome and with same measurements as yours I could make 13 muffins. Thanks for the receipe. Could you please post few more receipes for muffins in case you know some more and I am sure you must be knowing more? hi sailu, too many fans for u and nice comments from so many people because of mouth watering recipes from u. i am seeing ur recipes since many days and all are awesome. in this recipe, u used brown sugar, can we subsitute it with any other ingredient because here in my place it is not available, i think. can we use pattika bellam (telugu) pieces for this recipe instead of brown sugar? and brown sugar is not melting after cooking also? pls clear my doubts. i will surely try ur recipe tomorrow as i have bananas at home but not having brown sugar. i have to check if available in the shop today. Sailu, I finished baking these muffins just 15mins back and I could not wait to thank you for such a wonderful recipe. Soft and yummy muffins. I did a little tweaking, did not have cinnamon powder so substituted with nutmeg powder, I do not have a muffin mould so baked in a 6″ round baking pan. I did not do the crumb part as I was running late to pick up my son from school. Will do it next time. My son is napping now, waiting for him to wake up and have a go at the muffins. Once again thanks for the lovely muffins recipe!! I saw you posted a lemon cake recipe, going to try my hands at this one next. Tried this recipe n it was delicious!!! why did u add atta. Does it change the texture of the muffin or can v skip it ? One more question, do u have any article on making yoghurt at home. Can v make using store bought like Nestle, Heritage etc yoghurt in cups. just finished baking them and they’v turned out simply amazing!! as always you r fantastic. Hey sailu… can i use the same recipe for a small banana cake? made these 3 times in past 10 days. my family which isnt a cake or muffin fan asked for more. I didnt have white butter so i used ghee. 1st time-dark chocolate was chopped. 2nd time i added soaked black currants ( soaked just 30 mts )and toasted almonds and lesser ghee. 3rd time i just added more cinnamon. Each time this was a winner. A question- i want to make these for a friends 50th bday. Can i dress these up a bit? how? or add another tweak to it? My wife and me just did baking using this recipe. It did not cook properly inside. Couple of mistakes we might have done is 1) Used mixie to grind banana instead of hand mash 2) used cake tray instead of muffin moulds. Can some one confirm whether our findings are correct ? BTW, we had more than 90% success rate with this recipes. So absolutely no doubt about it.